Karbi, the next village N along the Kasakh gorge, has been known since the 13th century. 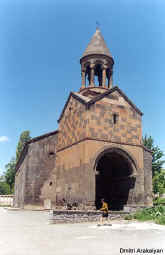 Though ravaged and plundered repeatedly, several churches remain: S. Astvatsatsin basilica of 1691-93, the 11-13th c. S. Kiraki or S. Gevorg, Tsiranavor and Tukh Manuk, and the "Zargarents Zham" chapel. Christians and Muslims. The church, with its distinctive striped drum below the conical cupola, was rebuilt in 1661-69 by order of the vardapet Yovhannes. It had an archbishop, a monk, five deacons, and one acolyte in 1830, supported by the revenues of Mughni village. 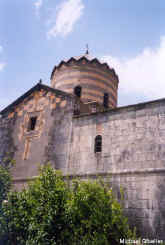 In 1999 the church was undergoing major restoration.